Welcome to a new installment of WHY HAVEN'T I SEEN THAT?, where we talk about a must-see or iconic movie that we have never seen...until now. This week we take a look at one of the best animated films out there, the 2010 Pixar threequel...TOY STORY 3. Enjoy. I have been putting off watching this movie for almost seven years now, and I swear I had a good reason why. I originally wanted to watch this movie with my mother when I graduated from high school in 2013, but she simply refused. Said she couldn’t take how sad it was. Since then, I hadn’t really thought to watch it because that was the way that I wanted to see it—through Andy’s eyes. Well, fast forward four years. I’ve just graduated college, and am leaving to work at a new college as a resident manager, and this time I’m leaving my fiancee behind for a year as she goes into her senior year at my alma mater. I figured if there was a time that I could try to recreate the magic of Andy leaving home, then I had to take my shot, and wow, I was right about that. Let me start off in talking about the cinematography of the film. Animated pieces aren’t always known for their beautiful shots, but there were places in Toy Story 3 that had me shaking Emily and saying, “Look at the way they framed that.” There was a specific moment at the very end that had Andy driving up the road, framed perfectly by white fences, that had me discussing the symmetry and beauty of the shot through my teary eyes. This was no Oscar winner for best cinematography, but I appreciate that that aspect of film making was not ignored by Pixar. The story-telling and script-writing department is where this movie especially thrives. Woody, Buzz, and the rest of the gang don’t miss a beat. The opening montage is one that will have you wishing to see an entire movie just about the playtimes that Andy had when he was a child. Sunnyside Daycare’s story line was a bit predictable at times, but still didn’t disappoint because it approached it in a way that was interesting. 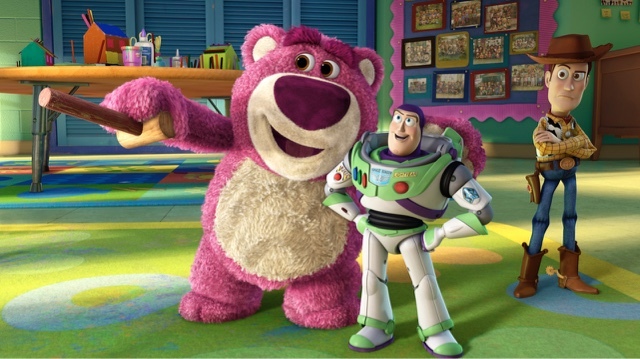 Lotso’s character reminded me of a mob boss at times because of the way he ran the joint and how ruthless he was. Woody coming to the rescue for the rest of the toys was in his nature, and the toddlers being too rough with the toys was something that we’ve all noticed at least once in our lifetime. What really succeeded here, however, was the story line of fearing abandonment. The toys battled something that we have all most definitely felt at one time or another in our lives. Whether it is from an ex, growing apart from old friends, or a fear that plagues your self-doubt, we’ve all feared the loneliness that abandonment brings, especially from someone who loves us. Despite being made of plastic, these toys were human-like, because we all understand what it is like to have an Andy in our lives who is growing away from us. Finally, this movie hit me right in the feels: every single one of them. As someone who is transitioning for the umpteenth time in my life, seeing the way that Andy was processing leaving his family behind spoke to me. I found that it was perfectly personified in his attachment to his childhood toys. It wasn’t too complicated like some high school dramas can get, and it didn't get too kitchy either. The toys were a perfect representation of everything that Andy was leaving, and how, while it was difficult, it needed to be done. A college boy can’t play with a spaceman and cowboy action figure forever. The toys experiencing this from their end was a good way of representing what it can be like to be on the other side of this, and learning to understand as someone moves on in their lives to things that they need to do. This movie had me laughing of course, but more than that it had me crying like a baby because I understood both sides of the equation, and it taught me that it was okay to be afraid about these things, but that ultimately it was a big part of life. I loved this movie. I recommend it to anyone and everyone. Don’t be afraid to pop it in as an adult just because it’s an animated kid’s film. Labels: Animated, Disney, Movie Reviews, Pixar, Tim Allen, Tom Hanks, Toy Story 3, Why Haven't I Seen That?